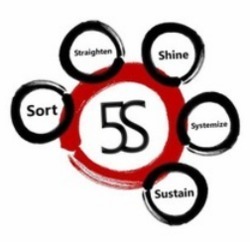 5S is the starting point of any quality initiative in a factory.5S represents Japanese words that describe the steps of a workplace organization process. Established in year 2004, Blue sky management services is a leading 5 S consultancy , 5 S auditing agency, 5 S certification consulting agency located at Ahmadabad in Gujarat India. 5S' is a tool with Japanese roots, focused on fostering and sustaining high quality housekeeping. 5S viz. A well implemented 5S is foundation for Operational Excellence. It improves Work Culture, Quality, Delivery, Morale and Safety. 5S also improves Teamwork and Total Employee Involvement. This programme is focused on long term sustenance of 5S and Visual Management Practices overcoming all challenges. A special techniqes to save the client being taught on request by highly experiences trainners. With the help of diligent and adept professionals, we have been able to offer our valued clients a qualitative 5S Training Service. Our provided service is a systematic approach to workplace organization. 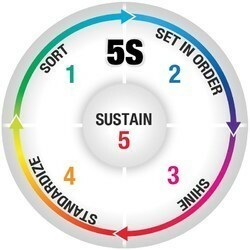 The provided 5S Training introduces the workforce to the concepts of SORT, SET-IN-ORDER, SHINE, STANDARDIZE, and SUSTAIN. Kloaz Certification Services Pvt. Ltd.
Seiri (Sorting) Seition (Stabilizing or Straightening Out) Seiso (Sweeping or Shining) Seiketsu (Standardizing) Shitsuke (Sustaining the).